Pam Perry Combs is no stranger to music or music industry; she has been a professional instrumentalist and vocalist for almost 40 years. Notably she has been nominated for a Grammy, Academy of Country Music Award (ACM), and a Country Music Association award (CMA). She is an award winning songwriter, and a member of NSAI. Pam was a recording artist for both Universal and Capitol records as part of the all female group Wild Rose, and has traveled extensively worldwide sharing her talents. 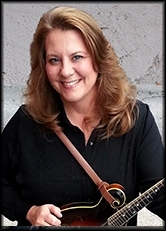 Pam has written for both Cumberland and Millhouse Publishing Groups, and has had her songs recorded by several Country and Bluegrass artists. After semi-retiring from the road, Pam performed for almost twenty years at the famed Renfro Valley Entertainment Center. Pam was also Director of Entertainment there for the last seven years of her tenure. She wrote, directed, and produced several award winning Productions for Renfro Valley, and retired from full time entertainment in 2011 to spend more time with her family. Pam has extensive experience with media, and advertising strategies that will benefit the EKU School of Music. She feels right at home in the music department, where she can use her musical experiences to assist the department, and looks forward to many more years at EKU!